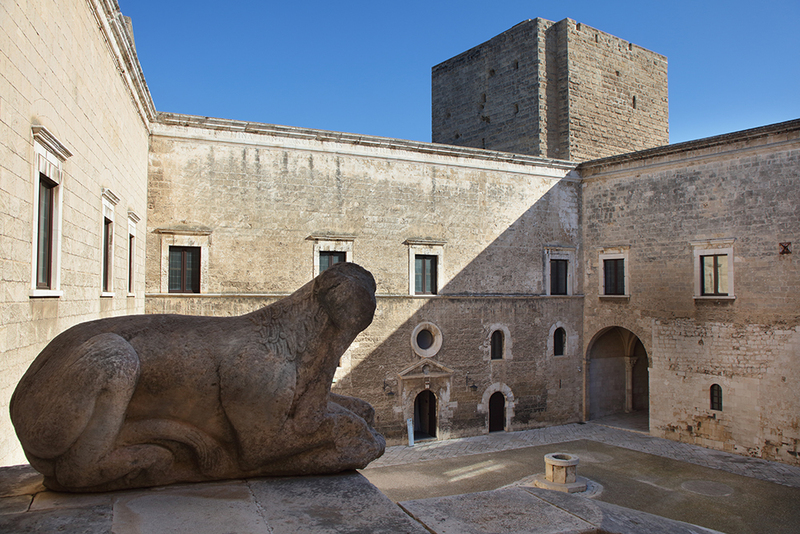 The Castello Svevo in Bari is a massive 13C fortress which now houses a museum. Standing on the edge of the old town, near the port and the Cathedral, with its huge bulk it is one of the city’s most important and best known monuments. 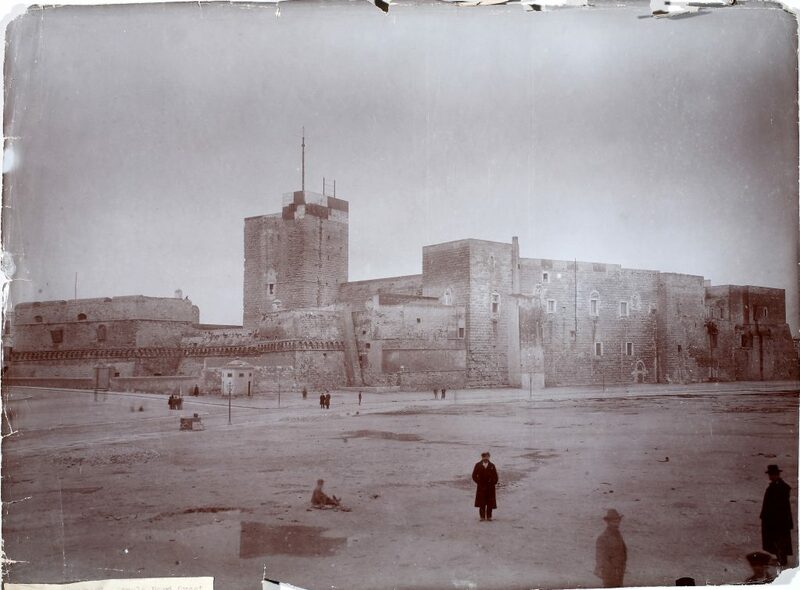 Historically attributed to the Norman King Roger II, the Castle was erected in 1131 above residential buildings from the Byzantine era, and after the destruction of the city by William the Bad it was rebuilt by Frederick II of Swabia between 1233 and 1240. In the second half of the 13C, Charles of Anjou ordered restoration works to reinforce the Castle’s northern wing, which at that time was actually on the sea. In the 16C, Isabella of Aragon and her daughter Bona Sforza radically transformed the Castle to respond to the development of heavy artillery, building a massive curtain wall with bastions around the Norman-Swabian core buildings, and at the same time adding Renaissance refinement to the complex’s interior. In the following centuries, especially under Bourbon rule, the Castle was largely left to decay, and it became first a prison and then a barracks. It was not until 1937 that it became the headquarters of the Apulia and Basilicata Heritage Directorate. In 2017, after works to restore the buildings and transform them for museum use, the Directorate’s offices were moved away and the whole of the Castle was restored to public use. The Norman-Swabian core has a trapezoidal ground plan with a central courtyard and three tall towers at the corners, made from heavily rusticated stone. Beyond the south-western tower (known as the “Minorenni” or “Juveniles” tower after the prison section it housed in the 19C) is the original entrance, the gateway from the time of Frederick II which leads into the central courtyard. Nowadays, this is overlooked by three saloons and a small chapel in classical style. 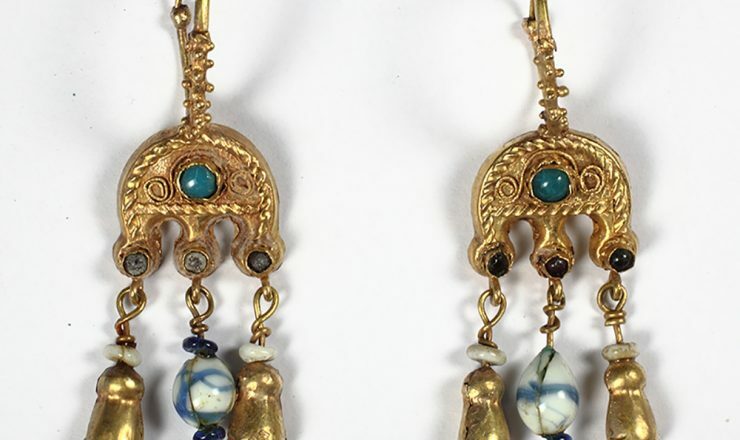 In the 16C, the Aragon Duchesses radically transformed the complex. Inside, the Castle acquired all the trappings of a Renaissance palace, with an elegant, impressive double staircase connecting the ground floor to the large saloons on the first floor. The ground floor of the Castle’s west wing houses the Gipsoteca, a collection of plaster copies of the sculptures and carvings of the most important monuments and cathedrals in the Apulia region, created by sculptors Pasquale Duretti and Mario Sabatelli in 1911 for the Regional History Exhibition to mark the 50th anniversary of Italian unification. 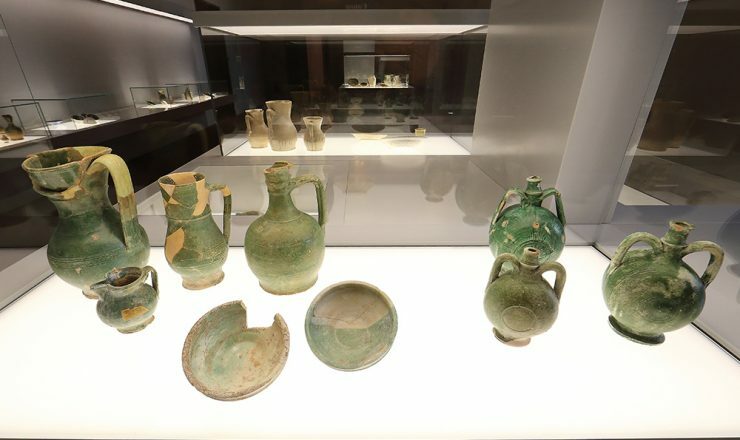 Also on the ground floor, visitors are able to view two small areas where archaeological digs have been conducted, revealing earlier structures dating from the Byzantine period. Thanks to the recent restoration work, completed in October 2017. the whole of the Castle’s first floor, with the main rooms used by the Castle’s aristocratic owners, is now open to the public. 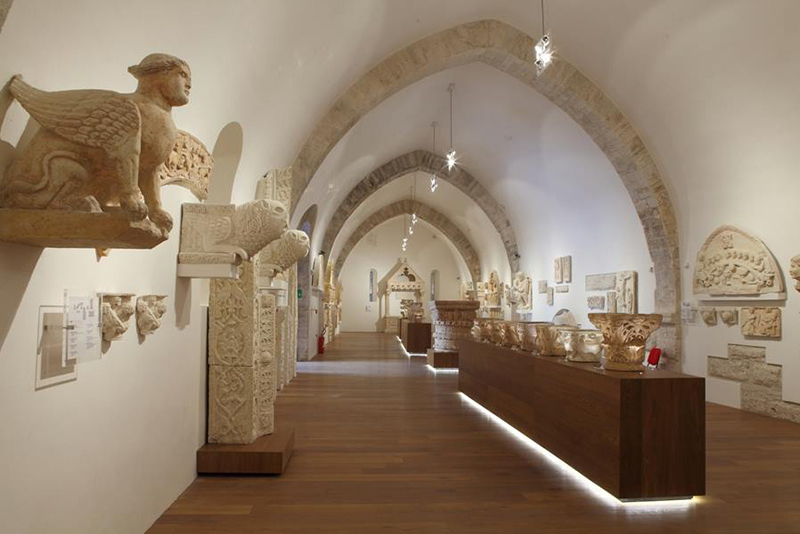 The Aragonese Room houses a permanent photographic exhibition telling the history of the Castle’s restoration and recovery for use throughout the 20C. 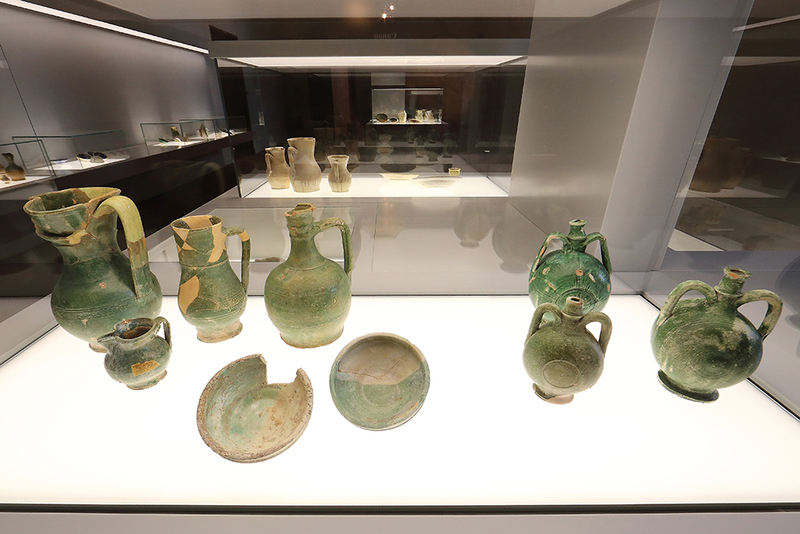 In the Angoina Room, visitors will find the archaeological collection of pottery obtained from the excavation of the Castle’s midden, which can be dated from the 15C to the 18C. 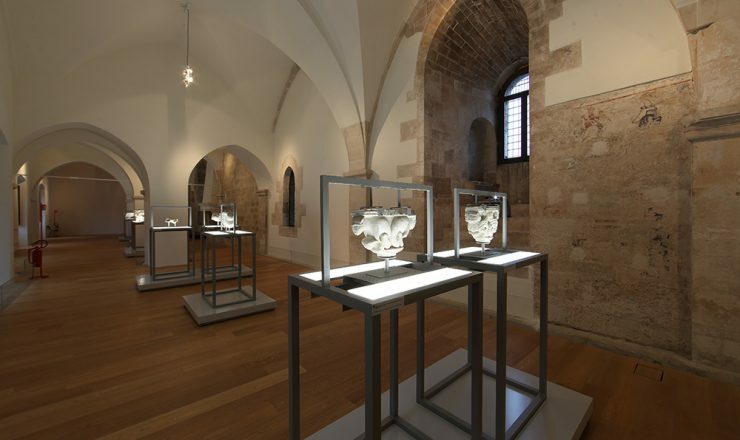 The Norman Room contains various unrelated stone items, while the small room on the first level of the Minorenni Tower houses jewellery and other precious items. The two largest rooms on the first floor, the Bona Sforza Room and the Frederick II Room, are used for temporary exhibitions and cultural events. 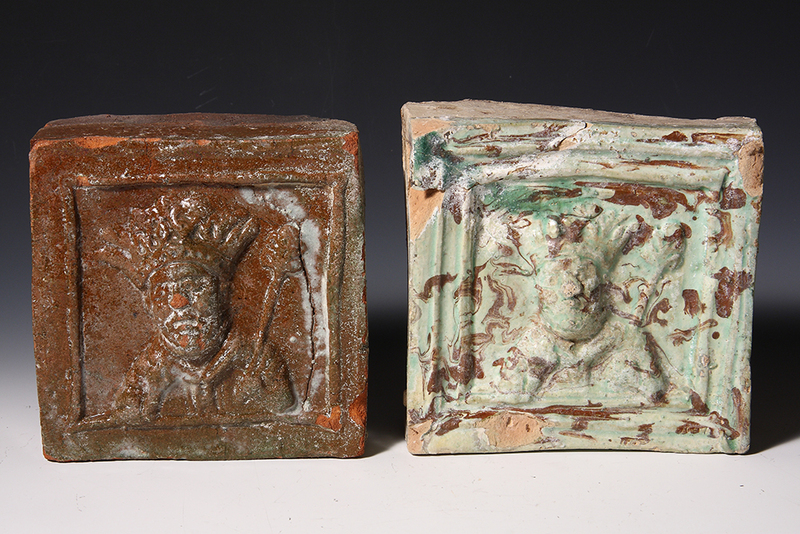 The archaeological digs conducted on the midden, or waste heap, beneath the east wing of the Castle, have yielded a collection of ceramic tableware which sheds light on the life of the Castle's court during the Renaissance. 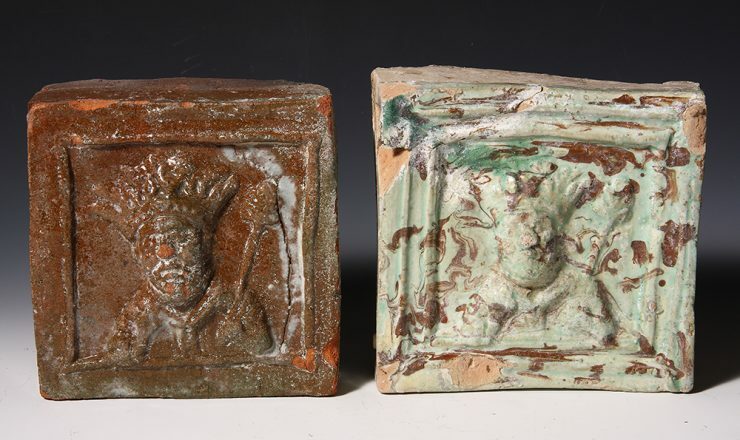 The two fired clay tiles with a transparent green glaze, both decorated with a crowned figure in relief, could be two trial samples for the cladding of the stoves that heated the Castle's large saloons in the 16C. 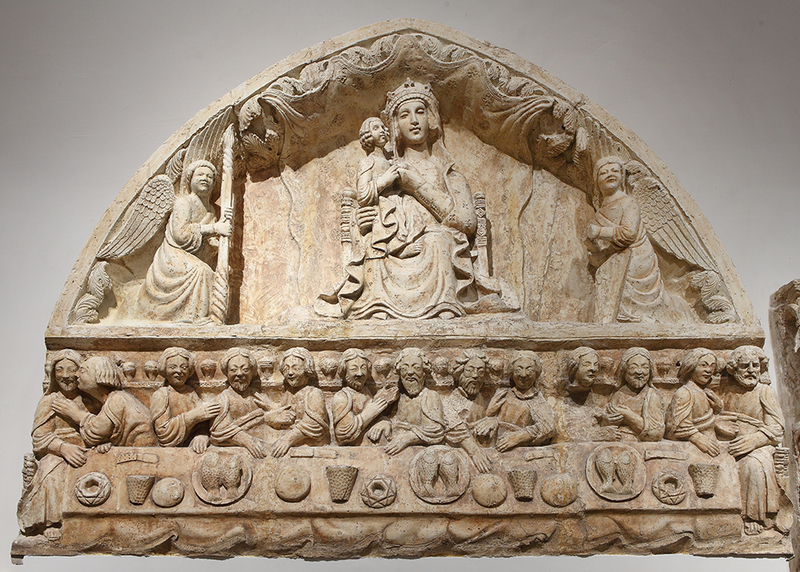 The plaster copy of the lunette of the main doorway of the Cathedral of Santa Maria Asssunta at Altamura is one of the most popular pieces in the Gipsoteca, with its appealing portrayal of the Madonna and Child and the Last Supper in high relief on the lintel. 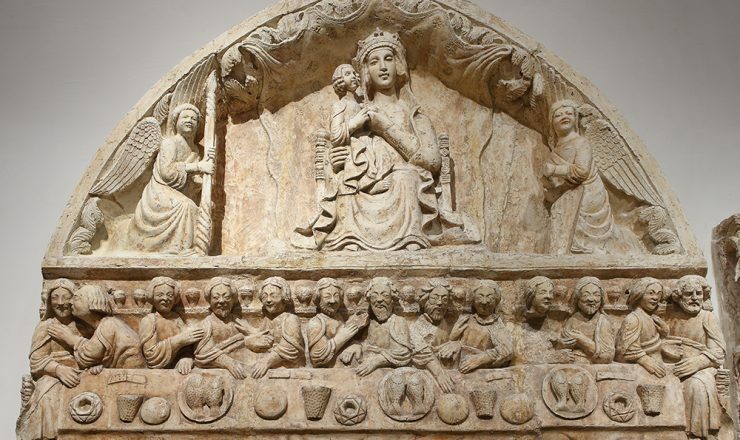 Today the Norman Room contains stone items of various origins, most impressively the two 11C capitals, carved with a pair of cats and winged lions, discovered during the excavations underneath the Sveva Room in the 1990s. 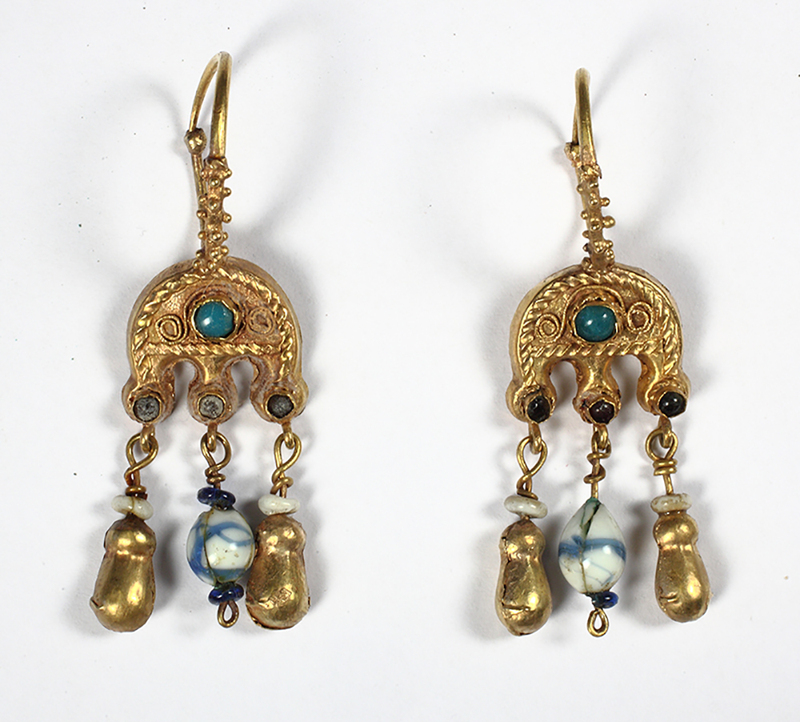 The items of jewellery displayed in the Minorenni Tower include these double drop earrings with pewter plating and blue stones, from a high-ranking female burial from the late antique necropolis at the basilica of San Leucio, at Canosa di Puglia. 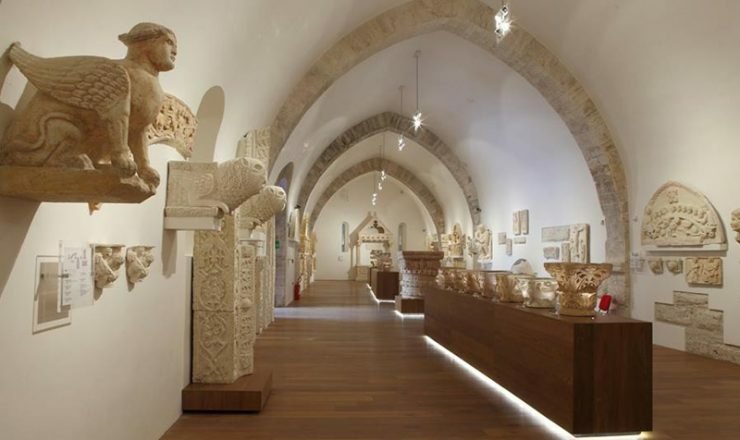 The Gipsoteca contains a collection of plaster copies of the sculptures and carvings of Apulia's most important monuments and cathedrals in the Apulia region created by sculptors Pasquale Duretti and Mario Sabatelli in 1911 for the Regional History Exhibition to mark the 50th anniversary of Italian unification. Visitors travelling by car should use the A14 motorway (Bari exit) or SS 16 highway (Bari centro exit). Bari ‘Karol Wojtyla’ International Airport is connected to Bari main railway station by the Metro Ferrovie Bari Nord railway / Bus line no. 16/ ‘Tempesta’ Shuttle Bus. Bari is linked by national railway services to Brindisi, Taranto, Lecce, Foggia and the main Italian cites, while the regional services of Ferrovie Bari Nord connect it to the area to the north, Ferrovie Sud Est to the south and Ferrovie Appulo Lucane to the west. The city bus services are operated by STP (local and regional lines), Marino Autolinee (long-distance lines) and Appulo Lucane (provincial lines). The urban service AMTAB no. 20 from the main station stops on P.zza Massari, near the Castle. Free: for all legally entitled categories.